It all began with a two-story Greek-Revival house in northern Wake County purchased by Calvin Jones in 1820 along with 600 acres of land, the oldest historic structure in the Town of Wake Forest. Initially used concurrently as a residence, doctor’s office, and post office, the property was sold in 1832 to the North Carolina Baptist Convention, which was seeking a suitable location to educate young ministers. What is now Wake Forest University opened here in 1834 and, under the guidance of first President Samuel Wait, began to develop a flourishing student body, advanced curriculum, and new brick campus. Today the Calvin Jones House is part of a four acre complex that includes gardens, pathways, and a state of the art museum. 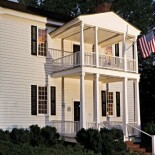 The house is furnished to reflect the period of its various residents, and the museum’s extensive displays depict the history of college and town. Welcome to the Wake Forest Historical Museum. The Society owns over 15,000 pages of documents ranging from the lecture notes of Dr. Willis Cullom to the football plays of Coach “Peahead” Walker. We have collected more than 5,000 photographs, approximately 1,000 books, and hundreds of artifacts.